I cannot completely agree that extensive travelling makes the background check longer; especially at this time where everyone travels for work & pleasure. If you have stayed in a country for more than 6 months; you will have to provide PCC (which I assume you have already provided). I have traveled for work & vacation to different countries and did not think that affected my application. My e-AOR was on Sep 13th and got the PPR on 31st Jan. Hope this helps to alleviate your concern. I just received an email from IRCC for the passport request. Although, nothing is updated on the portal. I hope that there are no more surprises. Just hang in there guys, you’ll get it soon. I wanted to share the good news with this very helpful and inspiring community. This morning I received a request for passport email even as my online account shows no change. I am a FSW-O applicant living in the US, only countries ever lived in are India and the US. Looking forward to the next steps. As I mentioned before, I submitted my PR application on July 23rd. 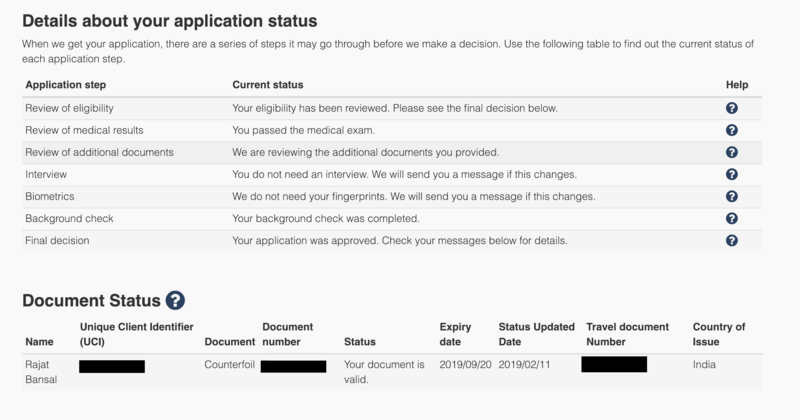 6 months have passed and after contacting them through the webform, all I have heard back was an automated response basically saying that my application is still in progress. I am living and working in Canada, so I had to apply for a work permit extension. I got my work permit extension approved on Feb 13. Does anyone know if that’s a good sign related to my PR process or is it not really related? Congrats to everyone that got their PPR! I had applied for my PR on July 28th under Provincial nominee express entry. I had also got a work permit extension on December 7th just like you and I am waiting to hear back from them for my PPR. 1 thing I know is the R10 check is completed which is you have complete application otherwise they dont extend your work permit. Thank you for replying! I tried finding out what R10 means but I’m not exactly clear on that. If you don’t mind me asking, what is the R10 and how does that affect our permanent resident application? I was in the same case as yours. My AOR is July 25th and I am currently working in Canada. I heard processing of PR under CEC before was really fast. But it’s been almost 7mos now and still stuck in IP2. Hope we get a good news soon. If your documents are submitted correctly you shouldn’t be worried. Just keep an eye on the medical report validity (one year from day of medical exam). There’s something called GCMS notes that you can order to check where you application is headed. @mrandmrs Looks like adding *67 when dialing from US is not longer working. The operating number disconnects the call saying that ‘this toll number is not intended for calls from your area’ or something of that effect. Has anyone tried this recently? I am November 8 AOR, living in the US for the past 9 years. I called CIC last Friday and the rep told me that everything looks “Good”. I asked him as to why I still haven’t received a request to submit Bio-metrics and he said that we don’t need it from everyone. Could anyone else share their experience? I am from Pakistan so I thought I still needed to give Bio-metrics even though its been close to 7 years since I have been back. Hi, I believe I got a ghost update, today my profile showed “application/profile updated” but there was no real update inside my profile. AOR is 22nd Oct 2018. Last update was IP2 in 1st week of Jan 2019. Does this mean I should expect a PPR email soon?